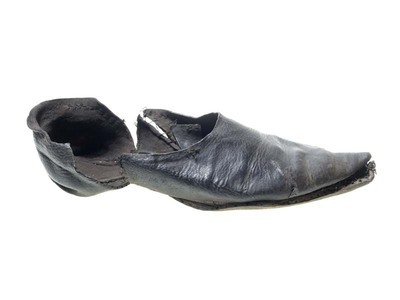 Made in the late fourteenth century, this black leather shoe is 255 millimeters in length, which indicates that it probably belonged to an adult male in medieval London. 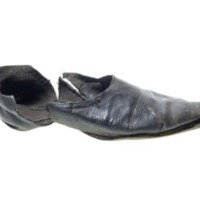 Because the mouth of the shoes rests below the ankle, this shoe is best-suited for indoor occupations. Presumably, the passage of time, as well as the activities of the original owner, have led to the shoe’s tears and weak construction. The point of the shoe contains moss to retain its shape. The tread of the shoe is 80 millimeters, the seat of the shoe is 65 millimeters, and the height of the shoe is 50 millimeters. “Shoe,” Medieval London, accessed April 22, 2019, http://medievallondon.ace.fordham.edu/items/show/85.